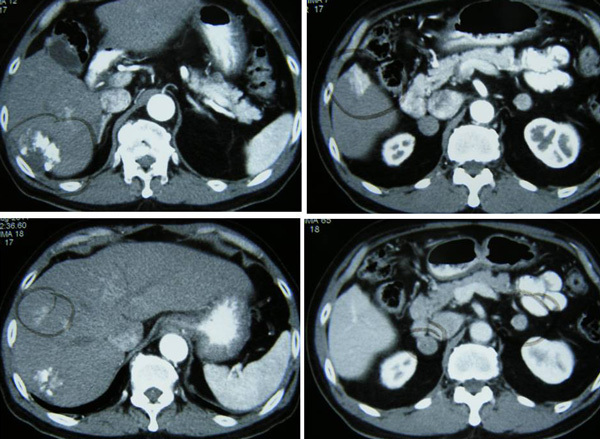 Liver Cancer Part 1: Tumour Shrunk After Chemoembolization (TACE) and Radiofrequency Ablation (RFA) But New Growths After Six Months. What has gone wrong? TD (S21) is a 67-year-old male from Indonesia. Sometime in May 2010, he suffered chest pains while visiting Shanghai, China. He subsequently underwent an angioplasty with (four) stent placement. While in the hospital, a CT scan showed a 8.5 x 7.0 x 4.5 cm mass in his liver. After TD was discharged from the Chinese hospital, he went back to Indonesia. On 2 June 2010,he went to Singapore for treatment of his liver cancer. 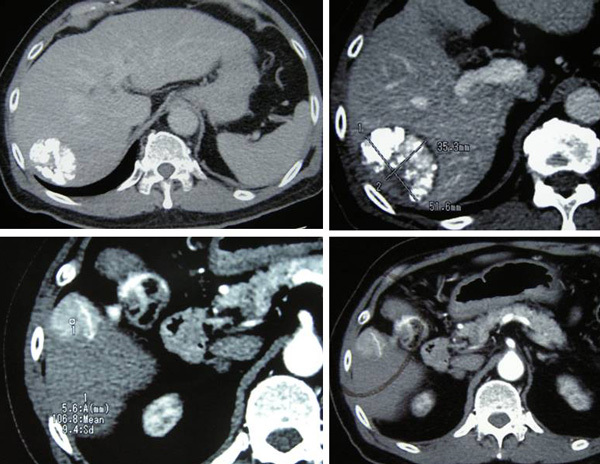 CT scan on 2 June 2010 showed a solitary mass in segments 6 and 7 in the right lobe of his liver, It measures 7.8 x 6.5 x 8.4 cm. This is compatible with a hepatoma. There is no involvement of the hepatic or portal veins. There is no definite extension beyond the liver capsule. No enlarge lymph nodes were seen in the para-aortic or portahepatis region. Bone scan on 2 June 2010 showed a mildly increased tracer activity in the mid to lower cervical spine, T4 and T5 vertebrae. 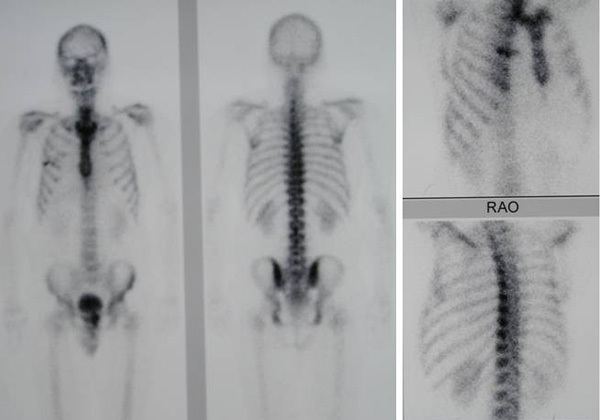 No conclusive scan evidence of bone metastasis. On 3 June 2010, TD underwent transarterial chemo-embolization (TACE). This procedure cost about S$9,000 each time. After two cycles of TACE, CT scan on 5 August 2010 showed the tumour has shrunk. The entire mass now measures 6.2 x 4.5 x 5.5 cm. The response was good with no evidence of metastasis. TACE was continued and on 16 September 2010, radiofrequency ablation (RFA) of the liver tumour was performed using a 2.5 x 20 cm cluster Cool-Tip RF electrode system. Two cycles of ablation were performed with repositioning of the cluster electrode in-between each cycle. CT scan on 6 October 2010 showed the tumour was significantly smaller in size, 4.7 x 5.4 x 4.6 cm. There was no evidence of recurrent or new lesions in the rest of the liver. No evidence of pulmonary metastataic deposits and no enlarged mediastinal or lymph nodes. 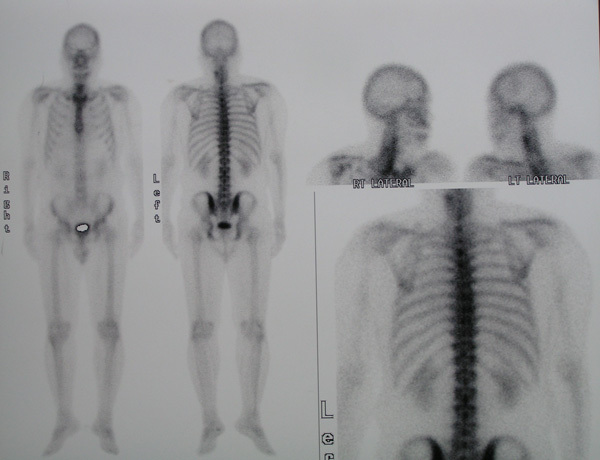 A bone scan was also performed on 6 October 2010. TD was told that there was nothing to worry about. The total cost of his treatment came to about S$60,000. During the routine checkup TD was asked to receive Zometa injection for his bone. Each injection coast S$1,200 and he received a total of 6 injections. On 6 April 2011, a CT scan was performed. The previously treated mass in the right lobe of his liver measures approximately 3.5 x 5.1 x 4.8 cm in size. There is no associated hypervascularity seen with this mass. However, there is a new lesion in segment 5 of the right lobe of his liver. It is 3.1 x 2.3 x 3.6 in size. This mass was not present on the previous scan of October 2010 and is suspicious of recurrent disease. TD was told to come back in two months’ time for another scan. Disappointed, TD did not want to see his Singapore oncologist any more. There is a 5.1 x 4.2 x 4.8 cm mass in segment 6 of the liver. There is a 2.7 x 2.8 x 3.3 cm enhancing lesion in segment 5 of the liver. There is an ill-defined enhancing lesion measuring about 2.3 cm in segment 8 of the liver. There is a 2.5 x 2 x 2.1 cm mass just inferior to the right adrenal gland. Metastasis? There is a 1.9 x 1.6 x 2.5 cm mass just inferior to the left adrenal gland. Metastasis? There is a lytic lesion in the vertebral body of T12. Fracture of the superior endplate of T12 is noted. This probably represents a bony metastasis. 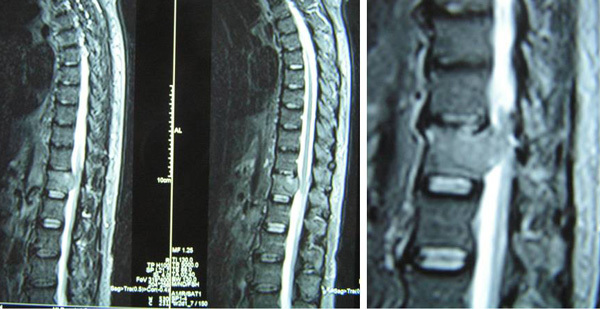 On 13 August 2011, MRI of the thoracic spine was carried out. The result confirmed a lesion measuring 3.5 x2.4 x 2.2 cm in T12 vertebra. The mass extends into the spinal canal and displacing the nerve roots. Findings are in keeping with a metastatic lesion. TS was referred to an oncologist who suggested that he undergo 10 times of radiation treatment to this back. This is to relieve the minor pains he complained about. TS came to CA Care on 14 August 2011. Listen to his story. Benefits of chemoembolization: Left untreated, patients with primary liver cancer who are ineligible for transplant or surgical resection have a life expectancy of three to six months. Recurrence: Even when chemoembolization eliminates existing tumors in the liver, new ones may appear. (University of Washington – http://www.rad.washington.edu/clinical/radiology-clinics/interventional-radiology-clinic/chemoembolization-of-liver-tumors). In about two-thirds of cases treated, chemoembolization can stop liver tumors from growing or cause them to shrink. This benefit lasts for an average of 10 to 14 months. Chemoembolization is a treatment, not a cure (http://www.radiologyinfo.org/en/info.cfm?pg=chemoembol). What is Radiofrequency Ablation (RFA)? RFA is an image-guided technique that heats and destroys cancer. Heat is generated locally by high frequency radio waves that are channeled into metal electrodes. A probe is inserted into the center of the tumor and the non-insulated electrodes, which are shaped like prongs, are projected into the tumor. The local heat that is generated melts the tissue. The probe is left in place for about 10-15 minutes. The ideal size of a liver cancer tumor for RFA is less than 5 cm. Larger tumors may require more than one session. (http://www.medicinenet.com/liver_cancer/page10.htm). Benefits of RFA: In most studies, more than half of the liver tumors treated by radiofrequency ablation have not recurred. The success rate for completely eliminating small liver tumors is greater than 85 percent. What RFA cannot do: Only lesions which can be seen on ultrasound are ablated. Undetected cancer cells, due to the technical limitations of ultrasound, are not treated. Ultrasound cannot detect cells. Therefore there is a chance that some tumor cells will not be killed during ablation and that new lesions in the liver can occur later (http://www.clevelandclinic.org/general/rfa/indication.html). Can RFA cure liver cancer? RFA of liver tumors is not considered a cure from cancer disease (http://www.clevelandclinic.org/general/rfa/indication.html). This treatment should be viewed as palliative (providing some relief), not curative (http://www.medicinenet.com/liver_cancer/page10.htm). A few years ago, I had a chance to visit a hospital in China and discuss with a doctor specialized in cryoablation (low temperature ablation). One concern about this treatment is recurrence or new growths found in other parts of the liver after the ablation procedure has been done. What then has gone wrong in this case? Nothing wrong actually! Recurrence or new growth can be expected. If that happens, do more of the same treatment again. The problem lies with TD and his wife. They are not computer savvy enough to be able to surf the net and find out the truth for themselves. And they are not knowledgeable enough to ask this all important question, “Can the treatment cure my cancer?” They took it for granted that it would. Indeed, patients need to be forewarned about this. Again, let me repeat, the procedures are palliative not curative. Patients may be disappointed if they expect that chemoembolization and/or RFA can cure their liver cancer. This entry was posted in Failure Story, Liver Cancer, Medical treatments by CA Care. Bookmark the permalink.